Used to be seen in the big screen battling villains with his bare fists, this time, Donnie Yen might be wielding a lightsaber. According to the official website of the movie, Yen and Wen join a prestigious roster of stars, which includes Academy Award nominee Felicity Jones (“The Theory of Everything”) and Academy Award winner Forest Whitaker (“The Last King of Scotland”). Other members of the stellar ensemble cast are English actor and rapper Riz Ahmed (“Shifty,” “Nightcrawler”), Mexican actor Diego Luna (“Y Tu Mama Tambien,” “Milk”), Australian actor and Primetime Emmy Award nominee Ben Mendelsohn (“The Dark Knight Rises,” Netflix’s “Bloodline”), internationally acclaimed Danish actor Mads Mikkelsen (“King Arthur,” “The Hunt”) and American actor and voice artist Alan Tudyk (Clark Kent/Superman’s voice in “Justice League: War” and Alistair Krei’s voice in “Big Hero 6”). Wen’s most recent directorial job was the 2014 action comedy, “Gone with the Bullets,” where he also appeared opposite Shu Qi, Ge You and Zhou Yun. Yen, who reprises his Wing Chun grandmaster role in Wilson Yip’s “Ip Man 3” set to be released in Feb. 2016, didn’t confirm his inclusion in the movie when asked about it during a brief meeting with the press on Aug. 15. The world wushu tournament champion said “no comment” when asked by a reporter. Yen and his wife attended a gala dinner in Singapore’s Civic Plaza at Ngee Ann City for the store opening of Swiss luxury watchmaker Hublot. With an initial title of “Star Wars Anthology: Rogue One,” the latest “Star Wars” movie has British director-screenwriter-cinematographer Gareth Edwards (“Monsters,” 2014 “Godzilla”) working behind the camera. It is produced by Kathleen Kennedy (“Jurassic Park,” “The Adventures of Tintin”), John Swartz and Emmy-winning director Tony To (HBO’s “Band of Brothers”). Kennedy also produced “Star Wars: The Force Awakens” (“Star Wars Episode VII: The Force Awakens”) to be shown in North America in Dec. 2015. All six “Stars Wars” films received their first screening in China during the 18th Shanghai International Film Festival in June. The next three episodes are the “Phantom Menace” (1999), “Attack of the Clones” (2002) and “Revenge of the Sith” (2005), all directed by George Lucas. 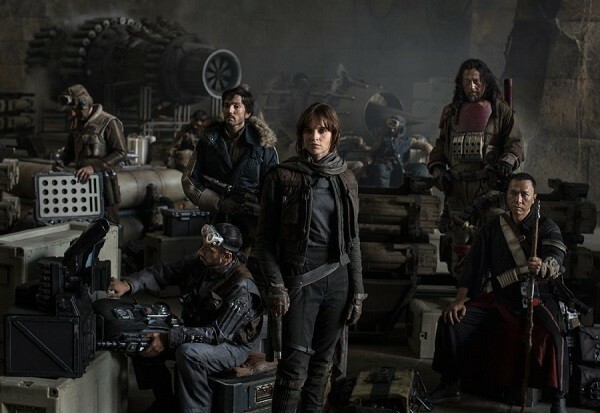 “Rogue One: A Star Wars Story” will have its U.S. premiere in Dec. 2016. May the force be with Donnie Yen and Jiang Wen! ‘Star Wars: Episode VIII’: ‘Guardians Of The Galaxy’ Actor Benicio Del Toro To Play Villain?